Source of Earliest Record: Mingyi Bielu. Part Used & Method for Pharamceutical Preparations: The leaves are picked at any time. It is best to prepare fresh leaves for use. Properties & Taste: Sweet and cold. Meridians: Heart, lung and stomach. 1. 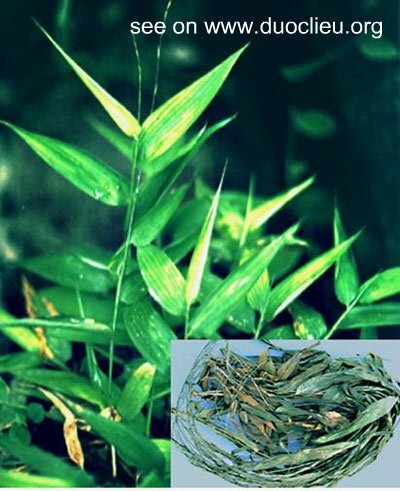 Thirst in febrile disease: Bamboo leaf (Zhuye) is used with Gypsum (Shigao) and Ophiopogon root (Maidong) in the formula Zhuye Shigao Tang. 2. Flaring up of heart fire manifested as ulceration in the mouth or on the tongue; or heart fire shifting to the small intestine manifested as dribbling urination: Bamboo leaf (Zhuye) is used with Clematis stem (Mutong) and Fresh rehmannia root (Shengdihuang) in the formula Daochi San.